Columbia Falls, Montana – PROOF Research—the science-based company revolutionizing the firearms industry with innovative materials and products—has released its latest precision rifle package. The new Switch rifle, named for its ability to be easily user-modified to accommodate a wide range of calibers and applications, is being described as the ultimate combination of performance and versatility. With an MSRP under $4,000 the Switch is also the premium rifle maker’s most affordable offering to date. The Switch comes standard with a free-floating, cut-rifled PROOF Research carbon-fiber barrel in one of five calibers: .223, 6 and 6.5mm Creedmoor, .260 or .308. The rifle’s incorporation of a Savage®-style barrel nut allows it to be user-converted to virtually any short-action caliber by simply replacing the barrel and the bolt face—without needing to replace the entire bolt, a part that can easily run over $300. Additional calibers (available in both steel and carbon-fiber barrels) are offered at a discount to Switch purchasers. This video demonstrates the installation process and overall system. The rifle also features a carbon fiber stock, adjustable TriggerTech trigger, 20 MOA Picatinny rail for optics, and a Bighorn Arms bolt with a unique floating bolt head that prevents misalignment and ensures accuracy. Like every PROOF rifle, the Switch is tested for accuracy and precision in the company’s state-of- the-art testing facility before it ships and is guaranteed for 1⁄2 MOA or better accuracy. 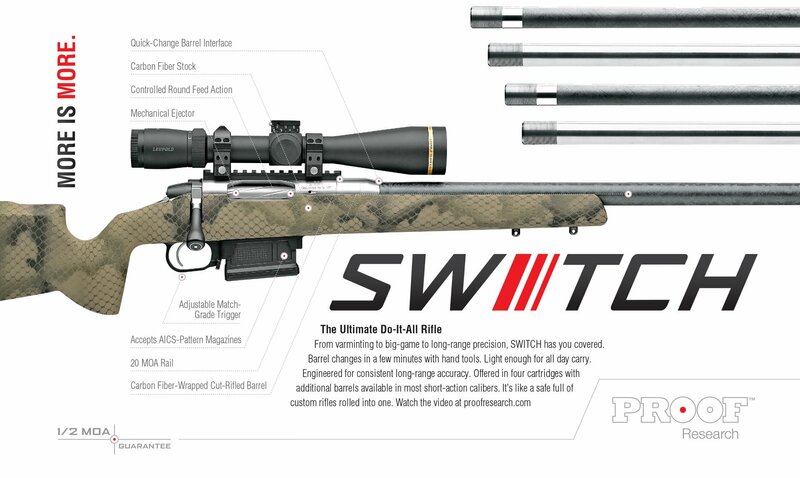 The Switch has an MSRP of $3,999 and is available through PROOF dealers, including Cabela’s. Barrels and bolt faces in additional calibers are available from dealers or directly from PROOF. Based in Northwest Montana, PROOF Research is committed to developing next-generation composite materials to produce the highest performance carbon fiber barrels, premium hunting rifles, and weapon systems that lighten warfighter load while increasing durability and effectiveness. PROOF Research’s goal is to make reduced weight, unsurpassed durability, and match-grade accuracy a reality for all of its customers. Headquartered in Columbia Falls, Montana, PROOF Research maintains research and manufacturing centers in Montana and Dayton, Ohio. www.proofresearch.com.